Some flatbed printers are equipped with ¾ automated or fully automated sheet loaders. These loaders enable printing multiple sheets in one go. 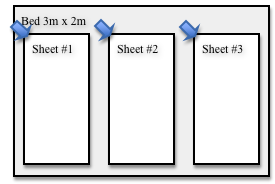 To support multiple sheets per bed there is a specific function in Layout that is explained in this article. When using multiple sheets per bed the sheets are positioned on fixed positions on the bed. These fixed positions are usually set using alignment points or using a template where the sheets fit. 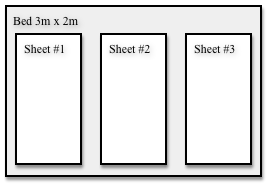 To fill the bed in Layout a job is created containing 3 sheets (pages) that have the size 30” x 60”. Each sheet is handled individually in Layout (related to the product) and will thus get its own cutting registration marks and tracking barcode. In the Multi Sheet function enter the top-left positions of each sheet on the bed. All positions are relative to the top-left of the most top-left image. This happens on printers that promote manual positioning. Most flatbed drivers strip all outside unprinted area. All positions are absolute when the driver supports the option “Output not-imaged area”. This option will create a job covering the full bed and thus allowing to use absolute positioning. Depending on the type of printer relative or absolute positions are to be provided to the Multi Sheet set-up in Layout. The sheets will be placed in the order they exist in the job. It move the sheet to the first available position in the list of provided positions. If a previous sheet covers one or more of the positions in the list then these are skipped by the placement system. If more sheets (pages) are provided than will fit on the bed (given the positions) then the Multi Sheet system will be disabled and the standard behaviour (multiple jobs) will be used again. Create/open a multipage job or multiple jobs in Editor or the RIP and invoke Layout. 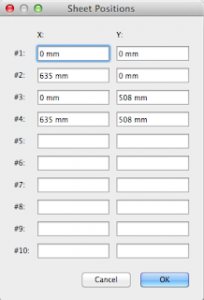 Select the sheet size from the Media Size pop-up or define it using Custom Size. Note: use to the menu item File > Output Devices > Edit Media Sizes in the RIP to define your own sheet sizes when not available. The Multi Sheet Loader is only active when a flatbed printer is selected. To disable the Multi Sheet Loader function select the menu item again to uncheck it.